– 2 Modified motors with more speed and torque pre-installed in gearboxes. – Torque sleeves added to both motors, increasing off-road power. 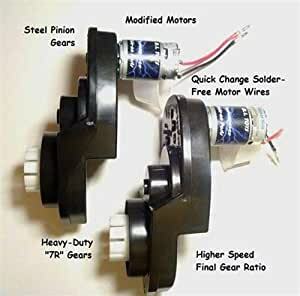 – Quick-change wire connectors that require no soldering to install and allow fast install/removal of gearcases! – Gearboxes are the newest 7R high strength design. Motors are safe for up to 18 volts. We strongly recommend using our Metal First Gears when running 18 volts or more. Just like when modifying a real car, modifying a Power Wheels voids all warranties. MLToys bears no responsibility for damage to vehicle, persons, or property incurred by modifying a vehicle. Be Smart, Be Safe, and Have Fun!